Virtual Platforms have emerged as a highly effective alternative to the use of hardware prototypes or emulation systems for embedded software development. These mechanisms enable early project starts, comprehensive verification solutions, and advanced code analysis and debug, to significantly improve code quality and time-to-market. OVP was formed in 2008 by Imperas Software, who donated a range of capabilities and model libraries to simplify the creation and use of virtual platforms. Imperas also provide a simulator, OVPsim, to demonstrate the OVP capabilities. Many engineers in both commercial and academic organizations have taken advantage of the tools and libraries on numerous projects worldwide. OVPsim, a high-performance software simulator, allows the simulation of code on processor models at 100s of millions of instructions per second on typical desktop machines. The OVP models interface to Imperas’ M*SDK range of advanced Verification, Profiling and Analysis (VAP) tools as well as the company’s unique 3Debug debugger. GDB and the Eclipse IDE may also be leveraged as part of the OVPsim solution. Fully functional models, many of them open source, are available for processors from ARM, Imagination Technologies MIPS, Altera, OpenCores, PowerPC, Renesas, Synopsys ARC, Xilinx and others. The models and Imperas tools support homogeneous and heterogeneous multicore architectures as well as other functionality contained within the specific processors. In addition, a range of peripheral models and other components are included as well as complete example platforms for specific architectures. 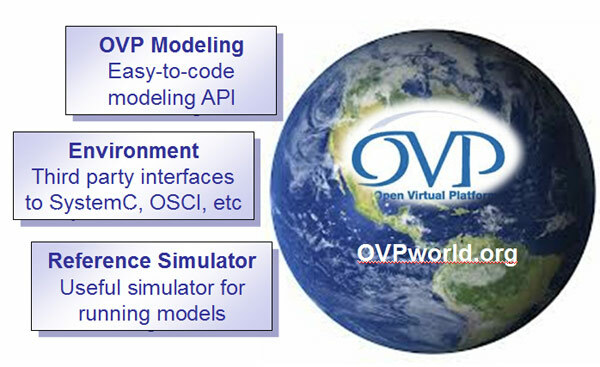 The OVP APIs allow for a comprehensive modeling environment allowing users to easily create a wide variety of high performance components for use with OVPsim and other OVP simulators. Interfaces are included to industry standards, such as SystemC and TLM2.